Great last minute gift for cat fans! Catakism is the faith of all humans who bow to their cat rulers. All cat owners, not just crazy cat ladies, will see much that is familiar in this pun-filled book. Broken down into chapters like The Book of Knead and The Book of Cat Posts, Catakism explains why cats are cool and how we are compelled to serve them. 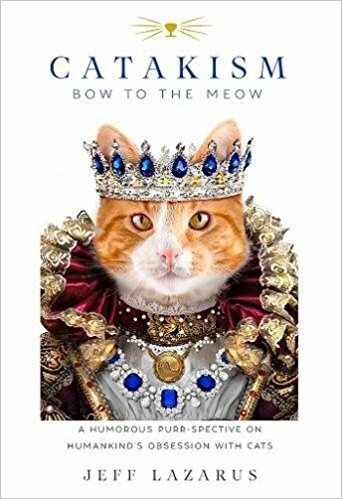 While not laugh-out-loud funny, there are many parts readers will be driven to share with other cat owners at home, at work and on the Internet. The puns get to be a bit much by the end but the cat photographs are funny and gorgeous. While ostensively a book worshipping cats, the author does highlight some of the silliness of cat ownership. Some examples are extensive purr-aphernia and “kitty litter cakes” (Google it!). Overall, this is a great gift for cat lovers and those living with them. 4 stars! Thanks to the publisher, Skyhorse Publishing, and NetGalley for a review copy.